White chocolate is a great non-chocolate candy to enjoy... even more so in ice cream form! It also pairs nicely with fresh summer fruits too. 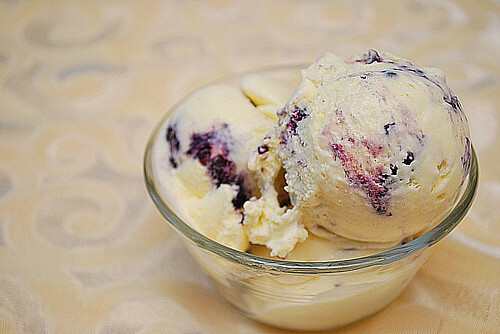 With this in mind, I churned up this Blackberry Swirled White Chocolate Ice Cream and my, it's heavenly! I came across a great sale on blackberries the other day and picked them up without knowing what to do with them. (I do this often... such a bad habit!) I suppose I could have just eaten them as is... but I like playing with food and making things, what can I say? So while I was in my ice cream churning frenzy, I came across a white chocolate ice cream recipe. That alone sounds amazing right? But since white chocolate pairs so nicely with fruits, why not mash up berries and swirl it in? That's exactly what I did and it was amazing. If you're not big on blackberries, you can easily sub them with strawberries, raspberries, blueberries, etc. The ice cream itself is not too sweet and it's super smooth, thanks to the custard base this recipe starts with. The chocolate flavor is subtle and with the blackberry swirl, it's comes out just a little more. This is one ice cream recipe to try since it's not only delicious, it's easy and more affordable to make at home! Put the chocolate pieces in a large bowl and and set a mesh strainer over the top. Warm the milk, sugar, and salt in a medium saucepan. In a separate medium bowl whisk together the egg yolks. Slowly pour the warm milk into the egg yolks, whisking constantly, then scrape the warmed egg yolks back into the saucepan. Stir the mixture constantly over medium heat with a heatproof spatula, scraping the bottom as you stir, until the mixture thickens and coats the spatula. Pour the custard through the strainer over the white chocolate. Stir until white chocolate is completely melted and the mixture is smooth, then stir in the cream. Stir until cool over an ice bath. Chill the mixture thoroughly in the refrigerator overnight for flavors to meld. When ready to prepare the ice cream, combine the berries and sugar in a bowl and mash slightly; set aside. Pour the chilled mixture into your ice cream maker and churn account to the manufacturer's instructions. After the ice cream has churned, alternately place the ice cream and a couple tablespoons of the blackberry mixture into your freezer container. Freezer overnight for ice cream to ripen before enjoying. Blackberries and white chocolate are two of my favourite ingredients! Sounds fantastic, the picture is very elegant too! Wow. Another ice cream?! It looks great!! Keep them coming. Ah, the blueberries have arrived! I'm more for chocolate-chocolate, but this pair makes me wanna indulge myself in! Oh yummy! I just ordered an ice cream maker for myself yesterday. I'll have to add this to my list of must try's. It looks amazing. going on now-Sunday night……Have a wonderful weekend!